The Semantic Data Model title work, launched last month, makes some changes to the way we extract data from the 245 field; part of this was dropping subfield $h from the display in favour of more descriptive terms found elsewhere in a record. We’ve tweaked the search results page, as originally discussed on the blog a few weeks ago, to draw more attention to the format by making it bold and displaying the most specific term, e.g. “eBook” rather than “Book, eBook, Eletronic Resource”. The end result is a more consistent experience – borrowers only need to look in a single place as they scan the page and the terminology used is the same from record to record. We’ve made a few other tweaks to the appearance of this page to make the layout more consistent as well. As with other Semantic Data Model features, you’ll need to be on the new version of marcgrab to see these changes. To support the upcoming switch to BDS for Prism enrichments, we’ve enabled cover images for non-ISBN records; this will show, subject to coverage, images for records that have an EAN or UPC catalogued in the 024 field. These images will start displaying once we complete the transition in the coming weeks and we’ll put out a notice when this happens. Customers with Syndetics enrichments can also benefit from this development; please raise a service request and we will make the required configuration changes to your tenancy. A common request we receive is for more control over the “My Account” login page, so we’ve added a new theme fragment which allows you to insert content in the same way as the homepage and header fragments. We’re releasing a small update to the Admin Console early this week which will pick up a file named “login.html” that you upload to your theme and insert it into your tenancy. Another page we’re enabling further customisation of is the no results screen. Uploading a file called “noresults.html” to your tenancy theme will include it below the existing content. 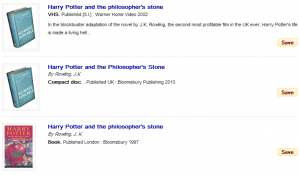 This fragment is treated a bit differently to others as it allows you to access the search query and insert it into your custom content, for example in a link to another search system such as Copac, the British Library or Google Books. As with the login fragment, this also relies on the Admin Console release this week. We’re pleased to announce that the recent Prism 3 release preview has been released to the live Prism 3 environment. For further details on what has changed, please refer to the release preview blog post. We’ve released this a little earlier than we normally would to ensure that certain features were out in time for our academic customers entering the start of a new semester. Keep up with the latest Talis Prism 3 news and developments on the Talis Prism 3 website and blog. We’ve just released the latest version of Talis Prism 3 for everyone to preview; this release contains some essential precursors for introducing the Semantic Data Model, as well as several other under-the-bonnet tweaks. The biggest change in this release is a new session tracking system. By tweaking how we handle “my account” sessions, we’ve been able make some changes which will allow us to further improve performance in Prism 3 going forward. We’ve also enabled Talis Aspire integration, allowing those of you with our next-generation resource list management system to flag what lists an item appears on. If your institution uses Talis Aspire and you would like us to enable this integration, please raise a support request and we will make the necessary configuration changes. Alternate graphic representation shown after clicking on the "Chinese" tab. As you can see, this release contains quite a lot of “under-the-bonnet” work so we’d really appreciate it if you can all cast an eye over your tenancies. To view the release preview, simply place /demo/ after the prism.talis.com part of your url, e.g. http://prism.talis.com/demo/leicestershire/. If you have any questions on this, or other issues, please feel free to email me (Phil.John@talis.com) or your account manager (or comment here, of course). The next webinar will be on Monday 23rd August, details will be posted on the Talis Prism blog shortly. You’ve heard us talking a lot about the Semantic Data Model (I provided a brief summary during the last Webinar, and it’s been covered in some detail on the blog posting back in January). What is it going to mean over the next few months for your Prism 3 catalogue though? we can weave information from other sources into the item display, augmenting the excellent data already present in your catalogue. The most important thing to note is that we aren’t “going dark” for an extended period, to emerge with the new data model as a finished item; we’re going to be tackling the task in a series of small, gradual steps. Throughout the next two quarters we’re aiming to provide regular releases when we finish each section, adding value straight away. The first area of data that we’re tackling is format. The MARC 21 specification offers a rich framework for describing the format of resources that we can mine to get better context for the items in your catalogue; this also underpins other work we want to implement, such as tailoring display of items to the demands of their media; by identifying “what” an item is, we can display context-sensitive enrichment. With CDs this could mean showing track listings fetched from MusicBrainz, and perhaps a short audio preview; with books, a synopsis would be more suitable (from the MARC record, or fetched from an external resource such as LibraryThing); for films, cast and production lists. In the work on format, we’re modelling both the form of content, such as dictionary, thesis, film, or poetry, and the carrier format such as Large print, CD or DVD. The model will enable the display of meaningful and specific terms to users in both descriptions and navigation options, such as E-book, DVD, VHS and Blu-ray. This is dependent on the data, of course. Format information will be extracted from all the relevant standard places in your MARC records and mapped into the data model. Some of the key parts of the MARC record for this include the Type of record and the Bibliographic level (Leader/06 and 07), control fields 007, 008 and 006, as well as data fields such as 300 and some notes. If an item is classed as a book, the most important field we’ll be looking at is 008. We’ll look at form of item (position 23) for some more specific book types, such as large print or online. The nature of contents and biography data elements (positions 24-27, 34) will provide some of the finer grained formats like biography, dictionary, encyclopaedia and thesis. Literary form (position 33) will allow broader categorisation of material into groups such as fiction, non-fiction, short stories and poetry. Field 007 also becomes important when dealing with items for readers with visual impairments, such as Braille or large print, so we’ll be looking there for these specific formats too. With all formats we’ll be looking out for the new “online” form of item (position 23) to help us with identifying online resources and allowing for easy faceting of searches for online-only material. For serials, we’ll once again look at the 008. The type of continuing resource (position 21) will help us identify items as newspaper, periodical or database resources. The form of original item (position 22) and form of item (position 23) will be used to flag information like if the item is microfilm, newspaper, large print or Braille. We’ll also be using information available in the 008 position 25-27 to identify formats such as comics/graphic novels. Visual material is more complex: we’re dealing with many carriers (with a fast pace of change), and the various types of content that can be delivered on them. The 007 field will be our primary reference: videorecording format (position 04) provides the carrier (DVD, Blu-ray etc. ), which will be supported by checks elsewhere such as 538 $a for specific values. 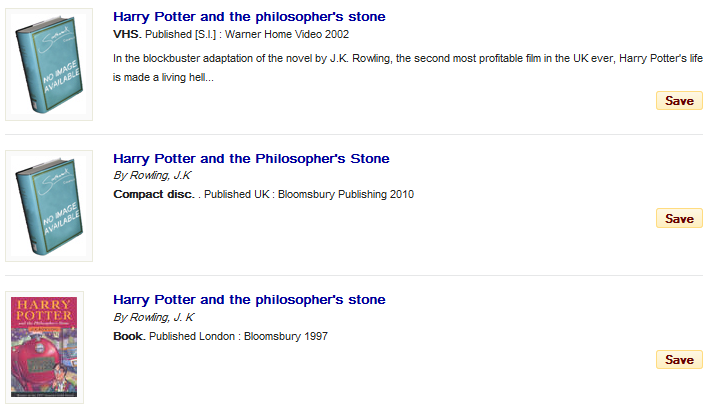 By looking at this data element we can separate DVDs, Blu-rays and VHS videos in the faceted search, which is important if a user doesn’t have a particular player and wishes to filter out certain formats. MARC 21 has some very fine-grained types for sound recordings and music, however, identifying the carrier can be a little tricky because the material designation in 007 contains broad categories. CD’s for example aren’t listed so we need to look at 007 position 03 to see a speed of 1.4m/s and position 06 for a diameter of 12cm; we’ll also look at 500 $a and 300 $a. For musical recordings, we’ll be looking in 008 to get the different forms of composition (position 18-19). Position 30-31 will give the work types for literary recordings such as Drama, History, Comedy and Lectures. Following on from music classification in audio recordings, items that are notated music will have specific data added to our model as well. Format of music (008 position 20) is the primary data element we’ll look at, followed by music parts (position 21) to describe what is included in the score. Target audience and transposition/arrangement (positions 22 and 33) will also be useful when looked at together, for example deriving that a score is a simplified arrangement for younger musicians. We’ve discussed some formats in detail, but of course there are others, such as maps and computer files. We’ll apply a similar methodology to extracting as much other format information as possible from your records. We’d love to hear if you have any comments or suggestions on our general approach; if you’d like to give us feedback you can either do it via email to Phil.John@talis.com or by posting a comment here on the blog.